An asymptote is a linear boundary that a curve gets very close to, but never reaches. Figure 1 is the graph of the function . The vertical asymptote is the line x = 1. Notice that f(x) is undefined at x = 1. This means that the value of f(x) gets very close to 0, but never reaches 0. So x = 1 is an asymptote of . also has a horizontal asymptote. f(x) can never reach the line y = 1. This is because there is no value of x such that f(x) = 1. 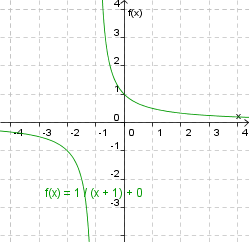 The horizontal asymptote of is f(x) = 1. Figure 2 is a graph of the function . What are the asymptotes of this function? 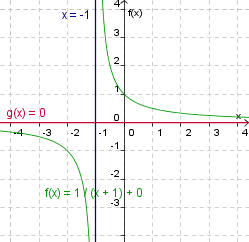 The asymptotes of are x = -1 and f(x) = 0. Click on the points on the slider bars to change the figure. As you slide the bars, the equation for the function changes. This also changes the asymptotes. What is the relationship between the function and the asymptotes? Manipulative 1 - Asymptote Created with GeoGebra. McAdams, David E. Asymptote . 4/12/2019. All Math Words Encyclopedia. Life is a Story Problem LLC. http://www.allmathwords.org/en/a/asymptote.html.